The tenth president of Washington State University, Elson S. Floyd, arrived in Pullman with aspirations to lead the University into a new era of prestige and growth. Even though Floyd faced an unprecedented budget crisis that drastically cut state funding, an uphill effort to establish a medical school, and a closely-held personal struggle with illness, he worked tirelessly toward WSU’s land-grant mission of service and access to education—and achieved his goals. Charismatic and intuitive, decisive and visionary, Floyd as a leader inspired the Cougar nation. In just eight years, he elevated the University in student access and diversity, research and private funding, academic and campus expansion, and service to the state. Floyd died June 20, 2015, in Pullman, after a battle with colon cancer. He was 59. In the wake of his passing, condolences and appreciation flooded into the campus and social media from students, alumni, dignitaries, and state and national leaders. He was remembered not just as an exceptional leader, but as a kind and loyal man who cared deeply about students, family, friends, and colleagues. Inslee and others recall Floyd’s warm smile, emotional intelligence, work ethic, and his unselfish and sincere desire to promote education. “He was somebody who was driven to succeed and change the world. He had a drive and a will that was incomparable. But he was driven for the greater good. It wasn’t about Elson Floyd. It wasn’t about WSU. It was what WSU and Elson Floyd could do for you,” says WSU Interim President Daniel Bernardo ’85 PhD. Floyd’s commitment to education began in Henderson, North Carolina, where he was born on February 29, 1956. The oldest of four boys, he was raised by his mother Dorothy and father Elson, neither of whom graduated from high school but desired an education for their sons. Dorothy said that, as a child, Floyd would do math problems in the sand because they couldn’t afford paper. “Dr. Floyd was a rags to riches guy. He was afforded a higher education because of scholarships and financial aid. He was all about providing that chance to others,” says Bernardo. Because of a scholarship opportunity, Floyd was the first African American to graduate from Darlington School, a prestigious private institution in Rome, Georgia. He excelled at school, both academically and socially as president of the student council, vice president of the honor council, and a three-sport athlete. He went on to college at the University of North Carolina, where he received his undergraduate and graduate degrees. Floyd began his career in higher education there as an assistant dean for student life. He also met and married the love of his life, Carmento. Floyd first came to Washington state in 1990 when he took leadership roles first at Eastern Washington University and then as executive director of the state’s Higher Education Coordinating Board. He returned to UNC as a vice provost and executive vice chancellor from 1995 to 1998. Floyd became president of Western Michigan University in 1998 and served there for five years. He worked as president of the University of Missouri from 2003 to 2007. When Floyd applied to be president as WSU, he immediately impressed the leaders of the University. Bernardo was dean of the College of Agriculture, Human and Natural Resource Sciences (CAHNRS) and a member of the presidential search committee when he met Floyd at the first interview. “I was a little bit cautious because he didn’t come up through the academic ranks. Then he spoke and two minutes into it, I knew who would be the next president of Washington State,” says Bernardo. WSU Regent Michael Worthy also recalls how Floyd’s magnetic presence and confidence, without arrogance or self-aggrandizement, won over the Board of Regents. “There was no dissension; it was unanimous. He was the one,” says Worthy. 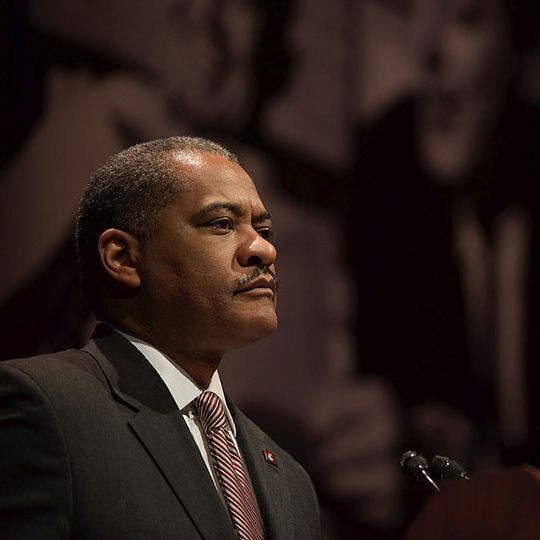 Floyd became WSU’s first black president in 2007, and he soon articulated a strategy of growth for the University, by connecting to its roots. One area that needed cultivating was WSU’s relationship with the agriculture industry. “We had sort of lost touch with the farmers in Washington state. Even though CAHNRS did good work with them, they didn’t get the sense that it was a priority for the University. That was one of the first things Dr. Floyd did, to reestablish that connection with the ag community,” says Worthy. Another of Floyd’s earliest endeavors was an ambitious tour to each of the state’s 39 counties to spread the word about WSU and its academic and service mission. “That entire tour set the course for his presidency because he was articulating the vision that we were in every county to serve the people of the state,” says Bernardo. Back on campus, Floyd quickly became a very visible and welcomed presence for the students. They affectionately called him “E Flo” when he sat with them at sports events and greeted them on campus. As a student, Rafael Pruneda remembers when he first saw the Floyds at the all-campus picnic in 2007. “He stood out because of his presence, and Mrs. Floyd had on this big, beautiful hat. I remember them walking from Beasley Coliseum to Mooberry Track and saying hello to everyone,” says Pruneda. Soon after Floyd became president, the worst fiscal crisis in University history struck in 2008, during the recession. Over the next several years, state funding was cut by 52 percent. Undaunted, Floyd was forced to make tough budget decisions, but never lost sight of his goals. Floyd was known for his transparency and honesty, and it was never more apparent than during the budget problems. He made it clear that he would safeguard WSU students, faculty, and staff as much as possible. Although tuition went up and some programs were cut, Floyd saw the tight budget times as an opportunity to focus the University on areas with demonstrated strength, such as veterinary medicine, agriculture, communication, and engineering. “It made us a very different university—a lot more nimble and entrepreneurial and one that is consciously not as dependent on state resources,” says Bernardo. Part of WSU’s resilience during the budget cuts came from an increase in private support. Floyd oversaw the “Campaign for Washington State University” and early on set an ambitious $1 billion fundraising goal. WSU topped the goal this year, thanks in great part to Floyd’s efforts—both in garnering major gifts from individuals like Bill and Melinda Gates, Paul Allen, Gene Voiland, and Oregon property developer Jordan Schnitzer, and in supporting other WSU fundraisers. Floyd also pushed the University to pursue more research funding. During his tenure, annual research expenditures grew by 57.5 percent, placing WSU among the top 11 percent of public universities for research funding. Floyd saw the urban campuses of WSU—Spokane, Tri-Cities, and Vancouver—as a priority for broadening access to education. Mel Netzhammer was selected as WSU Vancouver chancellor in 2012, the first chancellor appointed by Floyd. Netzhammer recalls how the president explained his plan for the campuses. “He wanted to create a new vision for the urban campuses that really complemented each other. He wanted to move away from this idea that the urban campuses needed to duplicate what was in Pullman,” says Netzhammer. Floyd later appointed Lisa Brown as chancellor of WSU Spokane and H. Keith Moo-Young chancellor of WSU Tri-Cities. All three oversaw expansion of their campuses in enrollment and academic success. Floyd also founded WSU North Puget Sound in Everett in 2012, and began discussions about a partnership with Bellevue College this year. WSU grew tremendously during Floyd’s presidency. Cranes and trucks were familiar sights at all WSU campuses, as the University completed 30 major construction projects. Among them: one of the world’s most technologically advanced wine science centers at WSU Tri-Cities; the first residence hall on the Pullman campus since 1971, followed by two more; Martin Stadium expansion and other athletic facilities; the Paul G. Allen School for Global Animal Health; several buildings at WSU Vancouver; and health sciences buildings in Spokane. Within the academic sphere, Floyd established the Edward R. Murrow College of Communication and brought back together the College of Arts and Sciences. In athletics, Floyd hired Athletic Director Bill Moos ’73, who then brought in new coaches and new energy for Cougar sports. Among Floyd’s many accomplishments, the establishment of a WSU medical school stands out as a singular achievement. Floyd saw access to health care as one of the core values for a land-grant institution. “He very clearly wanted medical education and medicine as part of WSU’s portfolio of things we did in a meaningful way,” says Ken Roberts, acting dean of WSU College of Medical Sciences. The process began by consolidating WSU’s health sciences programs on the Spokane campus, including the Colleges of Nursing and Pharmacy. When discussions frayed around expanding the WWAMI medical education partnership with the University of Washington, Floyd decided in 2014 to have WSU pursue a separately accredited medical school in Spokane. The University won strong bipartisan support from the state legislature for the medical school this spring, and the accreditation process will begin this fall. The new medical school will almost certainly be named for Floyd. “When the state does benefit from that new medical school, Elson will be attached to that. Twenty-five or fifty years from now, the medical school will probably be the thing most identified with Dr. Floyd,” says Roberts. The medical school and other changes at WSU were paralleled by achievements close to Floyd’s heart: student access to higher education. During his presidency, WSU had the highest enrollment rates in its history, peaking at almost 29,000 in 2014. Floyd made great efforts to get financial aid to students so they could come to the University, despite increases in tuition. “He was always a champion of affordable access. While some other universities wanted autonomy in setting tuition rates, he was lobbying to reduce the level of tuition,” says Worthy. Not only did the number of students increase across all of WSU’s campuses, the diversity of the student population expanded dramatically. From 2007 to 2014, the number of students of color almost doubled. “In a very thoughtful and strategic way, he said to the entire University community, we need to expand the percentage of our students from minority populations,” says Worthy. Elson and Carmento were both known for their compassion for students, through scholarships and aid, and even staying at the bedside of ill students until parents arrived. “When individual students were troubled, he took a genuine interest in their personal and academic welfare,” says Hill. Pruneda worked as a staff member for events in the Floyds’ home where he got to know the Floyd family. An ASWSU senator and leader among Latino students, Pruneda was appointed as a student regent in 2012. Even though Floyd didn’t know about the application, Pruneda credits the president for the inspiration and support. For Pruneda and the countless others who met him, Floyd’s warmth and character left a powerful impression. “When he would come into a room, he would really command your attention because he had this very bold presence. When he would smile, you knew he was a good person and he had your attention,” says Pruneda. Floyd’s charisma and intuition let him move smoothly between the worlds of business, politics, and academia. “Until I met President Floyd, I thought of university presidents as being circumspect and scholarly, but not harmonious with being decisive and a true executive. He was a president who could walk with scholars and be an academic, but he was a president who could walk with CEOs and be decisive,” says Gardner. Floyd connected to people no matter their social class, political leaning, or ethnicity, transcending his own childhood in the segregated South, says Gardner. It was a talent recognized by everyone, from students and alumni to state and national leaders. Floyd was admired for his diligence, even beyond his position at WSU. “He had a work ethic like I’ve never seen,” says Worthy. Worthy points to Floyd’s role as one of the most prominent African American educators in the country, chairman of the Pac-12 Conference, a member of the Knight Commission, a trustee at Oregon State University appointed by Oregon Gov. John Kitzhaber, and an active member of the Black fraternity Alpha Phi Alpha. On a personal level, Floyd was known to welcome students and others into his home, and even cook for them at times. “He had a really good Southern hospitality about him, both he and his wife. They were really proud of where they were from. They made sure any guests that came into their home were welcome. Whether it was a student or the governor, they were always treated well,” says Pruneda. He also remembers lighter moments, such as when Floyd was walking across campus during homecoming week and saw students dancing the “Electric Slide” on the mall. “He was watching us and then he stopped and started electric sliding with us. He had a big smile on his face. Not a lot of people can say they saw a university president electric slide on the Terrell Mall,” says Pruneda. Anecdotes of Floyd’s compassion abound at WSU and beyond. “As a person, there was a tender side to Elson that some people didn’t know,” says Bernardo. A Pullman grocery store clerk tells of helping Floyd at the checkout line. A teenaged boy behind him had some flowers, and Floyd asked who they were for. “My mother,” the boy replied. Floyd smiled, said, “That’s a fine thing,” and paid for the boy’s flowers. The memorial service in the Henderson church was attended by hundreds of Floyd’s family and friends as they laid him to rest and remembered the man they admired and loved. Floyd is survived by his beloved wife, Carmento; his mother, Dorothy; his daughter, Jessica Floyd Middlebrooks, (her husband Shawn) and granddaughter Victoria; his son, Kenneth Edwards and granddaughters, Kenae’ and Kennedy, all of North Carolina; and brothers, Michael and Dennis Floyd of North Carolina, and Garrett Floyd of Tyler, Texas. In lieu of flowers, the family suggests memorial gifts to honor President Floyd be made to the Elson S. Floyd Founders Fund for the WSU College of Medicine.